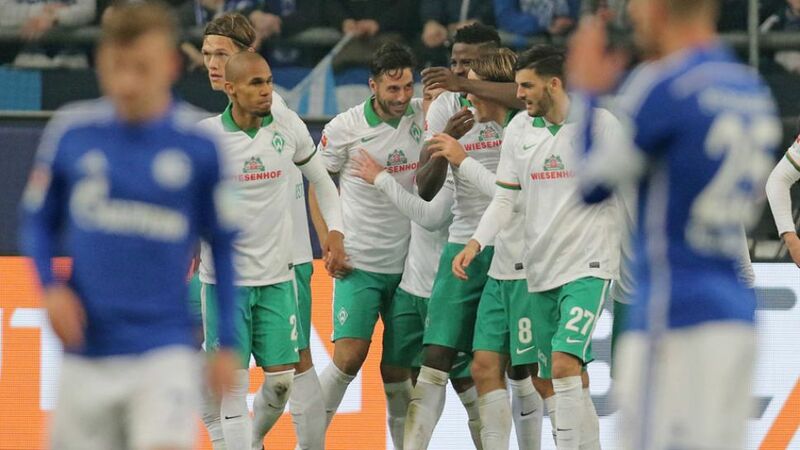 SV Werder Bremen sent out a clear statement of their intent to avoid relegation with a 3-1 victory away to FC Schalke 04 on Sunday. The hosts got off to a perfect start at a sold-out VELTINS-Arena when centre-back Joel Matip met a fourth-minute corner with a header that looped into the net. Schalke continued to dominate and should have extended their lead, only for Klaas-Jan Huntelaar to miss two one-on-ones with Bremen 'keeper Felix Wiedwald. They paid for that profligacy just before half-time when Clemens Fritz curled in a shock equaliser from the edge of the area. Worse was to come for the Royal Blues as Claudio Pizarro scored his 179th Bundesliga goal with a well-taken left-footed finish to put Bremen in front in the second half. Both teams looked to add to the scoreline in the closing stages, but it was the visitors who found the target again when Anthony Ujah flicked in Fritz’s cross from the left, sealing Bremen’s first win at Schalke since May 2010. Fritz scored the all-important equaliser at a crucial time and also provided two assists to turn the game around and give Bremen three priceless points in their battle against relegation. In earning a first Bundesliga victory since Matchday 12, Bremen showed enough fight to indicate that they have the ability to pull away from the drop zone. Matip’s goal was the earliest Schalke have scored this season. Before the winter break their quickest strike came in the 17th minute. Schalke have now scored five times from corners this term – more than any other Bundesliga team.Fritz, making his 300th Bundesliga appearance, scored for the first time since 20 August 2011.